Just wanted to say thank you so very much for arranging the Assam and Meghalaya trip for us. Once again, you did a fantastic job! We had a wonderful time. Loved, both the tea plantation bunglow and the cottage, excellent service and very serene surroundings. View from the room was to die for! It was great to see the mighty Brahmputra from our room at Ashok and Iora was conveniently and nicely located! The driver was excellent and the guide was very good. In Shillong, we told guide that we would like to see the Living Bridge instead of whatever was planned for that first day. He was a little concerned at first saying, he'll have to talk to his driver and the office, so I told him to do whatever was necessary as we really wanted to see it. Happy to say that they were very accommodating! Guide was very good with showing us the right spots for local shopping, spotting and pointing out various flora and fauna. He even spotted Bihu dance at a school just off the road and took us there! Altogether, it was a very memorable trip which culminated in us being able to "gate crash" a Trade Union Youth Festival function (at Ashok) where we truly enjoyed the various Tribal Dances of NE India! What color, what music, what grace and what beautiful people! Great way to end the trip; we'll never forget it! Finally, just want to commend you guys "on a job well done"! STIC is my agency of choice when I travel in India and YOU are my choice of planner, for you know exactly what we like! Needless to say, I tell about you and STIC to all my friends and relatives. "Here is to a beautiful" relationship! Thank you again! It was a memorable trip and our families enjoyed a lot. 1) Hotels Elegant and luxurious 2) Vehicle Excellent condition 3) Driver Decent, polite and good driving sense particularly on the hills Last but not the least your coordination in organizing such a long tour was excellent. One thing is for sure whenever I plan a holiday I will STICK with STIC and I mean it. Wish you all the best in future at your workplace as well as home place. Well, I returned safe and sound from India and in good health:). All I can say is for now is that India was an experience. Our High Commission in India had high regard for the STIC Travel group and they (the HC) kept in touch with me throughout my short trip. The chauffeur arrangement worked out fine and I did tell Shivam that the driver- Balvinder- was very trustworthy. 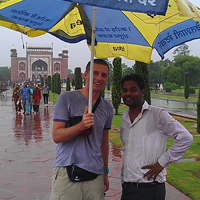 I asked for him to be assigned to my New Delhi Tour together with the tour guide. The hotel at Haridwar was really quaint. It is really on the bank of the Ganges and in the heart of the shopping area. I was able to walk to the Har ki Pauri ghat and to the station for the cable car to Mansa Devi Mandir. I did not have a problem however. Parkland was a regular hotel - free internet which was a big plus. If I had stayed longer I would have visited the shopping areas - did not really get a chance to shop. I think to shop in India you have to get an assistant. I really cannot haggle with vendors. It is too tiring. The Delhi Tour worked out well. I visited a number of places. I enjoyed the Mahatma Gandhi place and the Akshardhaam Mandir, the latter of course needed more time although I spent about 3 hours plus there. I will tell you more of my Rishikesh/Haridwar experience when I get back to work next week. Btw, all my flights were smooth, no turbulence at all and premium economy is definitely preferable for long flights. Thanks again for everything, even though it got to a bit challenging. Shubh Divali to both of you and hope you have a good one! We were very pleased expecially with Ram, the driver. He was very well behaved, profesional and also drives very well. I will also share some photos with you. Incredible and Amazing experience touring India ! Here is how we would describe our visit to India. Incredible and Amazing experience touring India ! The food was great! We walked the streets in all of the places we visited and the people were very nice and friendly. Taj Mahal was just awesome as we went to visit it late afternoon and early morning, around 6:00 am. The story behind Taj Mahal is really very nice and how it glows and how it was protected especially on a full moon. Shopping for novelty items was Great! We brought home spices, curry, brass items, white marble, Indian cook ware, curta...etc We are now planing for our second visit to India and we will definitely contact you for our travel arrangement. The only downside of your visit to India is the "Visa on Arrival". Perhaps the concerned office can review the process as it took us approximately two hours to process our visit visa. I wanted to give you some feedback on our and our guests’ experience with STIC recently. I should highlight that even thought I say STIC and the companies significant resources were behind everything that was done, the face of STIC for hundreds of our guests was Shivam Sarmah. To give you some context, we got married in Jaipur in early April and picked STIC. The wedding had all the hallmarks of a logistical nightmare spanning the entire ‘golden triangle’ and beyond. Everyone had very specific requirements and the requirements of the wedding itself were also very significant and complicated. We had about 200 guests flying in from outside of India (and about a 100 from various parts of India) and Shivam became the point person to help them all plan their various requirements. Throughout the process, from months before the wedding, in the weeks leading upto the wedding, during the wedding (when tension was at its highest) and following the wedding, Shivam and his team were fully clued in, professional to a degree I’ve not seen anywhere before and unbelievably responsive. The level of service was phenomenal and each and every one of our guests were hugely complementary about Shivam and how well everything was organised. I can’t commend his and his team’s performance enough. They were phenomenal and you should hold onto that man with everything you have! I want to complement you again on the service that your firm provided everyone that dealt with it, and thank you for being the backbone of our wedding and allowing us to have the time of our lives. Just to say hi and many thanks again for the enjoyable India trip! Everything went just fine and we appreciate the effort both of you put in to make our holiday a memorable one. We do hope ( and look forward ) to make another trip next year, with your help. Speaking of which, may I ask you to kindly forward the package brochure you've mentioned to me last time? I'd like to pass it to my officemates who are interested. Till then, best regards to you both. All in the rotary group are back and feedback is positive and excellent, thanks to your meticulous care as well as planning. Magaret Hayes was very pleased they went to LEH. Flower, despite cutting short his tour, stated this was the best tour he has had. So a feather in your cap! I can’t thank you enough for all the effort you went to to make our trip one of the most memorable we have ever been on. Overall the experience was very positive. Ram , our driver was very careful and responsible, punctual and professional at all times despite some very trying conditions. We were grateful for the upgraded vehicle, I think it gave a more comfortable ride on some of the worse roads. The air conditioning in the vehicle also seemed to work very well and the car was kept immaculately clean. The choice of hotels was again excellent in most cases. I would not recommend the Inn season at Jodhpur. Obtaining meals was a problem and the reception staff made off with our passports for half an hour to photocopy them in the market, which gave us some anxiety at the time! Highlights were the Mandawa castle hotel, the Mandir palace at Jaisalmer and the Pushkar palace. We also really liked Clarke’s hotel in Shimla. I thought the itinerary gave a very balanced view of the “real” India which is what we were seeking. The Metropolitan Hotel in Delhi was a great home base for our trip as we found it very convenient and also consistent. Having had two road trips with STIC a generation apart, I am happy to say that your standards have remained as high as ever and I would highly recommend you!! We both had an outstanding journey and vacation. We thank you sincerely. I am very busy back at work so have to be brief. I can safely say that we both though that everything was near-perfect. If you would like constructive criticism, then I could say that we both thought that one night in Tea Valley resort would have been enough (and perhaps have spent 2 nights in Mumbai at the end or 2 nights in Cardamom county [lovely hotel]). Similarly you know we were not big fans of Kohinoor Elite (thanks so much for changing to the continental). We also would have preferred a house boat that was not all glass (both levels were enclosed). However, to be honest, these are all minor points in an otherwise perfect holiday. In particular we really enjoyed the dinner at Zuri. Outstanding! I can't finish without saying how great we thought our driver was. He was one of the holiday highlights. Since we got back from India I have been wanting to drop you a line to thank you for you marvellous organization. All the guides were extremely pleasant and well prepaired, our driver was the best driver in the crazy Jaipur and Agra traffic and all went nice and smooth. Thank you very much! we will safely store your contact details for future India trips and to recommend to friends as well. Thank you for a wonderful trip! Fateh Prakash hotel was a really great option as the rooms were beautiful, we were upgraded to a frontal 3 windowed suite with a view on the lake palace, jagmandir, monsoon palace and hanuman ghat area which was exceptional, breakfast from the sunset terrace was beautiful again. I also found it very convenient to be in the city palace enclave with our walks to and from the city. I would not have thought of Fateh Prakash without your advice as for some strange reason it is not well liked by tripadvisor reviewers, but they have it wrong from my point of view. Being upgraded with the car was a definite improvement as the delhi- rajasthan route has long drive times on a tight schedule such as ours. The driver was very good, polite, and what I really liked was that he used the horn only when he needed, and not automatically, as has been one of my experiences in India. The car was very comfortable and we had a good view from our seats. All the other upgrades we had were terrific as well - in castle mandawa, gajner palace with beautiful rooms, in gajner palace with a view right on the lake. We felt well cared for with your frequent phoning in. I will definitely recommend you to our friends on their journeys to India. Truly wonderful trip to Humpi, Bellur etc. I've been meaning to email you both since getting back in late January, 5 blissful weeks of no computer and no constantly ringing phone is fast fading away! Its been full-on since getting back, but the work is good and I'm thankful for that. My friend and colleague Kim, my cousin Lakshmi and I, had a truly wonderful trip to Humpi, Bellur etc. Once again Shivam did a top job in taking care of every detail of our trip. STIC's contact in Bangalore met us on arrival in Bangalore with our assigned driver Shashi who took extremely good care of us 3 ladies - and I mean extremely good care. We had a bit of an adventure - my friend Kim wasn't feeling too well on the morning that we left from Hospet to Hassen and on our arrival in Hassen 7 1/2 hrs later (as we were giving our details at the reception) she realised that she had left her passport, her jeweler and all her cash (Australian Dollars $1200) in her room safe at the Royal Orchid in Hospet!! My first call was to Shivam (before I called the Royal Orchid) and I asked Shivam whether I should call you to expedite matters, for I know India well enough to know that if matters are not dealt with immediately something else will take precedence and then you go down on the list and are not a priority any more. Shivam said to give him sometime to sort it out and true to his word he very efficiently dealt with the whole matter and once the manager of the Royal Orchid opened the safe and assured us that all the contents were secured Shivam and our driver Shashi organised for a car and driver from the Bangalore office to pick up Kim's stuff in Hospet and they had it all to me safely and intact the next morning at 8am in Hassen! Believe me Shivam did STIC proud that day. Kim couldn't believe how fast she got her stuff back - literally overnight! But the highlight of the trip for all 3 of us was our assigned driver Shashi. As you well know I have travelled the roads of India since I was 7, but in all these years I have never had a driver like Shashi. Ver professional, takes great pride in his work, caring, careful, accommodative and very dependable. I have decide that for all the South Indian trips I do in future I'm going to request for Shashi. He is good. Take care, hope to see you in Sydney soon, will be back in Chennai in July and am thinking of doing a short side trip, either to Goa or Kerala then! Finally have the chance to provide feedback of our India Trip. Since I came back from the trip, had successive workshops and meetings to catch up with the holiday season action plans. The handling of the trip was "very good" except for the lost opportunity of having to book for 1 night as the flight got delayed (arrived past 3am) and the trip to the hotel is almost an hour with early departure to Agra. I suggest that for this first day, wash-up accomodation will be advisable. We did have a good driver, Suresh, though we are really pinning our feet everytime it by passes the other vehicles. Without Suresh driving prowess and knowledge, we could have not reached Agra on time because of the local villagers protest who blocked the expressway. We did enjoy the additional side trip and tour of the local villagers farms and homes. We heard that around 50% of the tourists who were caught by the blockage were not able to see Taj Majal. 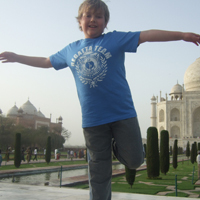 The rest of the itineraries were done well and the highly cultural experience of India was clearly witnessed by us. In fact, from the time I reported back to work and with my colleagues inquiring about the experience, I kept on enticing them to already save and go for the trip - of course with STIC. Thank you also for hosting the dinner and for showing us your STIC office and PAL's. I will be communicating with you for our next trip to Kathmandu. Good luck to a better 2012 - Happy Holidays ! I write to thank you for organizing our trip to India and providing all the assistance we needed. I enjoyed my trip because of the rich and tasty food, nice accommodations at Metropolitan and Royal Orchid, wonderful historical sights especially the magnificent Taj Mahal and Fort Amber, our driver JP and tour guides Saif and Narin, and your kind hospitality. I'm sorry for writing so late, I buckled down to work as soon as I got back to the Philippines. The trip was a meaningful experience of a different culture, people, and environment. It was interesting to note that India traces its roots to an Afghan-Indian intermarriage which explains the architectural design of your historical structures, the various types of Indian food, and other aspects of your culture that mark this infuence. Again, thank you from all of us. We hope to meet you someday either in Manila or India when we get the chance to return. Just dropping a note to say thank you for arranging the tour for us. Although we did not get the chance meet, I was able to see a photo of you with my other colleagues who were also in India last week. 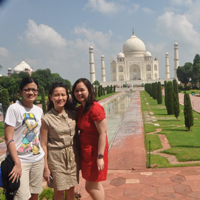 I will certainly share my recent Incredible !ndia trip and recommend your travel agency to my friends and colleagues. It was really such as short trip and wish we had a day or two more to explore Delhi and Jaipur City and to shop. Saiyif and Narin are such wonderful guides and our driver JP is a courteous and very skilled driver. I did not get a saree as we didn't know where I could wear such colorful dress. Here is a photo of our group. Rossana is in the middle and I'm in the garfield shirt. But, I did get a lot of bangles in Delhi. We truly had a wonderful time in India. Thank you. We have finally come back to Croatia. Thank you very much for your services. We were very very satisfied with Ram, he was not only the driver to us, he was more than that. We are very pleased and happy to have met such a professional yet friendly man on which we could count on at our journey. We send our best regards once more to him! Also, guides in Agra and Jaipur were excellent! Thank you. We will recommend you to further tourists going to India, with all our hearts. It was an absolute pleasure working with STIC Travels and the responsiveness to critical situations (and i know for sure we had way too many of them during the board week) we really very good. I know that your team had bent backwords to be able to help us make this event a success and anything that i amy say to thank you for doing so, will just be so inadequate. I look forward to my next event in Delhi, that might require similar logistics off me, so i may have to opportunity to work with you again. It is always a pleasure to work with Stic as you are the most professional people I have dealt with in this business for the last so many years. As usual it was a pleasure the way the whole arrangements were handled and the dedication shown by your people in getting the job done right. I would like to personally thank you for an excellent job in making the whole conference a success. By Ramesh Venkatraman, ALCON LABS Pvt LTD. It is so nice to be able to meet with you in person when we were there in New Delhi. We wish you a very blessed new year. We would like to thank you again for the assistance in planning our Rajasthan tour in December. It is our first experience of India holiday and I must say all of us enjoyed the tour. Also thank you for organizing the letter for the money loss at New Delhi and the return of the defected art work in Jaipur. The efficiency in decision making and arrangement for the money collection has really impressed us. It really had saved our time to do the goods return and money refund. Further, most of the tour guides assigned to our group are friendly and knowledgeable. The driver and his assistant are very helpful and kind to us. Just a little feedback, it would be better to consider sight-seeing first then proceed to check in to the hotel when the group is traveling from one place to another to save time. We had a wonderful time in India, thanks to all your planning and bookings. The Taxi driver was a very good and a really nice man. We enjoyed his company. The house boat in Alleypey was very relaxing. All our train rides were great. By the time the train got to Delhi, it was freezing outside and cold inside. We are back in Houston and back to our regular grind. Thank you very much for your support in organising our Atlas Group incentive tour to Malaysia from March 8-11, 2008. I have got the feedback from Mr Angad Kapur, Vice President, Atlas Cycles who mentioned that the tour was organised very well. Dealers really enjoyed themselves. Over all the tour was a success and I would like to thank you for all your efforts and of course the efforts of your staff. Your staff had been extremely helpful and efficient in his dealings with us, needless to mention the problems that we had with dealers not sending us right specification photos or timely delivery of passports, but it was all handled well by you. I would like to especially thank you for being so understanding with the payments issue, and we do hope that in future too our tours will be taken care of by you. Thank you, we did have a safe flight back -- although I must say that leaving Delhi at midnight and flying all night without sleep has left me a bit jet-lagged! Your assistance and the itinerary was absolutely fabulous and very much appreciated. I have already let the Indian High Commission here know what a great job you did, and am saying the same in a letter which your Chairman, Mr. Goyal, should be receiving soon. Thank you again for the lunch and for all your help, and I will certainly recommend your company to any others who may plan to travel to India! Really my Indian tour was very memorable and we enjoyed a lot. Thank you very much for meeting us in Agra, as well as arranging a complementary lunch in Delhi at a very good restaurant. We really appreciate your after sales service. Driver was also excellent. I will give your reference to my friends who ever look for any tour arrangements. We are back in Sri Lanka after a very good tour in India.You have done an excellent job and every body in our group who went on the golden traingle tour was very satisfied. Every thing was perfect the coach the driver guides hotels there was nothing to compalin. Thank you very much for organising the thing so well and I would definetely recommend you to any body who wants to tour India.